5 out of 4 turns 3! 5 out of 4 is thrilled to be celebrating 3 years of creating together with ‘Modern patterns for the whole family’. It has certainly been an exciting journey and we are so glad you have joined us for the ride. To celebrate this milestone, the 5 out of 4 team has put together some fun games, awesome prizes and of course a site-wide sale! We are thankful to have an amazing group of sponsors who have joined us to help celebrate. A big thank you to Sly Fox Fabrics, So Sew English, Raspberry Creek Fabrics, Made Whimsy Fabrics, Phee Fabrics, Boho Fabrics, Simply by Ti, RockerByeDestash Fabrics, RP Custom Fabrics, Snowy Owl Custom Fabrics , and Vinegar and Honey for their generous prize donations. 1) Sew a garment using a 5 out of 4 pattern and share across social media with the hashtag #5oo4turns3. 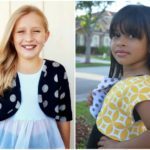 You can share in sewing and fabric groups on Facebook that allow hashtags, on Instagram, and even your own pages and groups. And of course don’t forget to share in the 5 out of 4 group too. Just be sure your posts are public, use the #5oo4turns3 hashtag, and tag 5 out of 4 in the post so we can find it when searching for eligible entries. 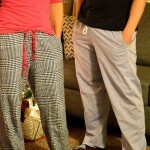 The more items you sew and post, the more entries you will gain for a chance to win a prize in the giveaway! 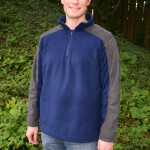 If you need to grab some patterns to sew up, use code HAPPY to save 40% off your order at www.5outof4.com. The sale will run through Sunday January 21. 2) Check the 5 out of 4 Facebook group for trivia games and scavengers hunts throughout the week. Some of the games will accept entries for 24 hours and others will be open for shorter time periods. Don’t worry, we will post the games during different times so no one time zone has an advantage over the others. For options 1 and 2, we will draw random winners throughout the week for prizes that include gift cards and sewing notions. 3) And lastly, we have a Rafflecopter set up where you can gain multiple entries for chances to win a prize from one of our sponsors. The Rafflecopter will remain open through Saturday January 20. The full list of winners will be posted in the 5 out of 4 Facebook group on Monday January 22. 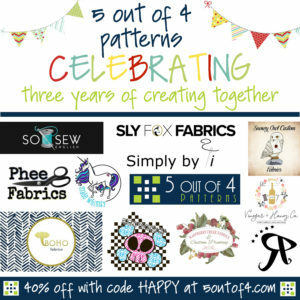 So come join the fun and Thank you again for your support of 5 out of 4 PDF Patterns! picked up some more patterns Thank you and congratulations!